"Quibbit! Quibbet!" The frogs all croak loudly over each other. 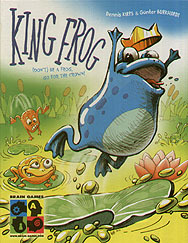 The pond is a flurry of commotion and excitement because today is the day of the Royal Frog Race. Your goal is to remain afloat for as long as possible outlasting your opponents as you hop around the pond. But hop ahead wisely! If you land on a water lily that is not your colour, you will have to pay a penalty!